The Bank of Japan kept monetary policy steady Friday, noting that the economy is recovering but warning of recent weakness in Japanese exports and production. 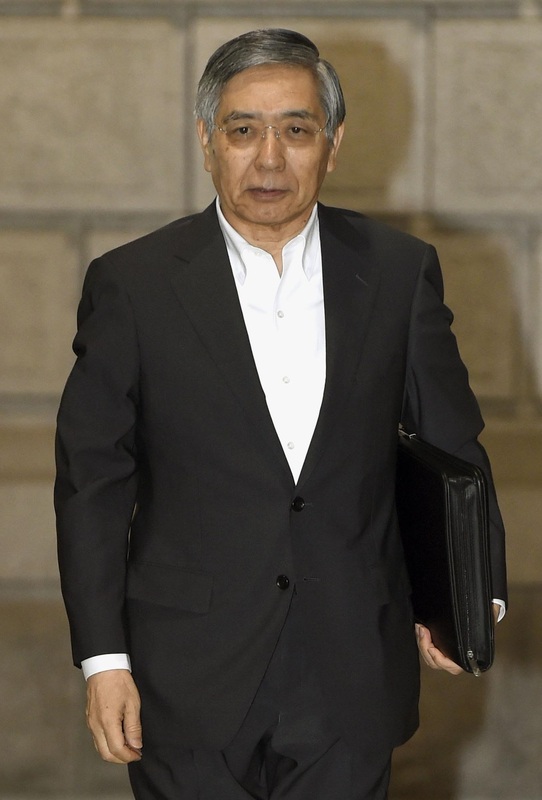 The BOJ decided to continue making massive asset purchases from banks to expand the nation’s monetary base by ¥60 trillion to ¥70 trillion a year as it attempts to stoke 2 percent inflation. The decision was made in a unanimous vote by the central bank’s Policy Board at the end of its two-day meeting. “Japan’s economy has continued to recover moderately as a trend, although the subsequent decline in demand following the front-loaded increase prior to the (April 1) consumption tax hike has been observed,” the BOJ said in a statement, leaving its overall assessment of the economy unchanged. But the BOJ downgraded its view on exports. Earlier in the day, government data showed that the current account balance fell into the red in the first half, due largely to weak exports, leading Japan to post its first deficit on a first-half basis in nearly 30 years. Growth in exports has been subdued despite the weakened yen, which normally helps make prices for Japanese goods more competitive internationally, and despite signs that the economic recovery in the United States is growing stronger. The nine-member BOJ board also apparently delved into the cause of the situation during the meeting. BOJ policymakers have recently looked at structural change as a possibility, stressing that more Japanese firms, particularly manufacturers, have moved production overseas to take advantage of cheaper labor costs. The sluggishness of exports have led to lackluster production. Different data showed late last month that industrial output slid 3.3 percent in June from May, the sharpest drop in more than three years, casting a shadow over the country’s campaign to overcome chronic deflation with a radical stimulus plan launched by the government of Prime Minister Shinzo Abe and executed by the BOJ in April 2013. 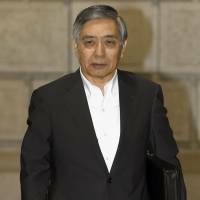 Still, its decision to refrain from expanding what it calls “quantitative and qualitative monetary easing” suggests that the BOJ believes the economy is on the path to achieving its 2 percent inflation target, at least as measured by the core consumer price index, which excludes fresh food but not energy. The central bank says the core CPI will keep rising at around 1.25 percent year on year for some time, excluding the direct effect of the sales tax hike. In June, the index grew 1.3 percent from a year before, slowing from 1.5 percent in April and 1.4 percent in May. The BOJ expects inflation to accelerate again starting this fall. The BOJ statement said that “private consumption and housing investment have remained resilient as a trend” with the employment and income situations steadily improving, while business investment “has increased moderately as corporate profits have improved,” keeping its assessments unchanged. Economic growth data is under particular scrutiny. The government will announce the April-June gross domestic product figure on Wednesday, and economists say is certain to have shrunk because of the consumption tax hike. The drop in GDP could be followed by a rebound to some extent in the July-September quarter, but some analysts say that if the economy does not recover sufficiently during the quarter, then pressure will grow for the BOJ to ease monetary policy further unless Abe finally succeeds in achieving economic structural reform.